........... to all you Mums, grandmothers, friends and aunties out there. I hope you have a wonderful day and hopefully receive some extra love from your precious ones. 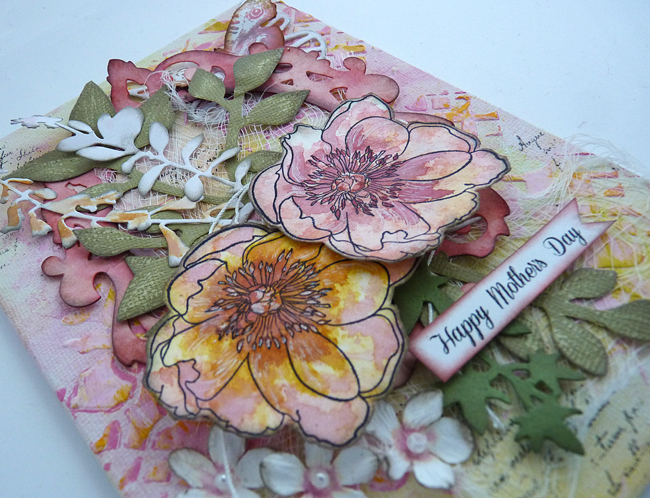 I have a Mother's Day project right at the end of this post, but first here's one I did for a workshop. I often get asked to do a session for one of the local church groups and this time they wanted me to do something 'different' (ie not card making or gift bags, paper folding etc) so I suggested using paint and making a mixed media shabby canvas board - you know how I like these - so this is what I came up with. Bearing in mind we only had two hours there was a lot to do but I die-cut and prepped a bag for each of them so everything was at hand. 1. 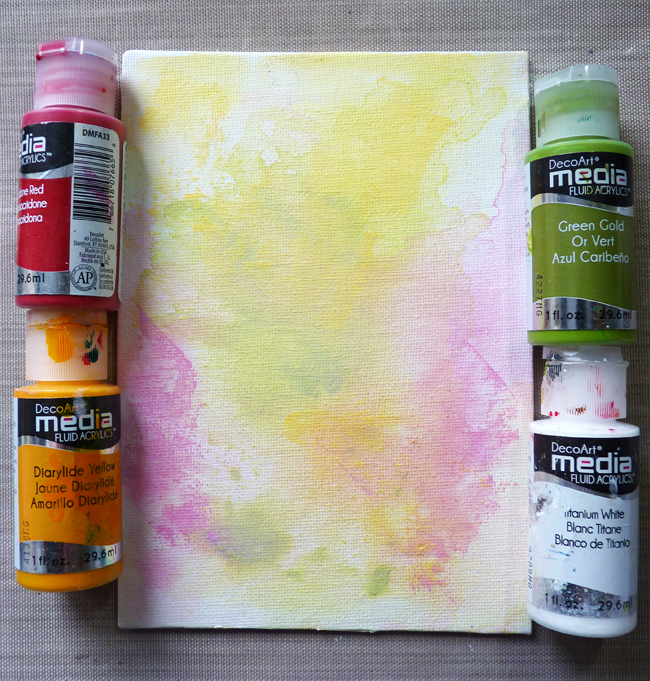 Paint canvas with gesso. 2. With palette knife randomly drag thin layer of acrylic paint and spritz with water, move the colour around a little bit - dry. 3. Repeat step 2 with another colour. 4. Repeat step 2 again with a third colour. 5. 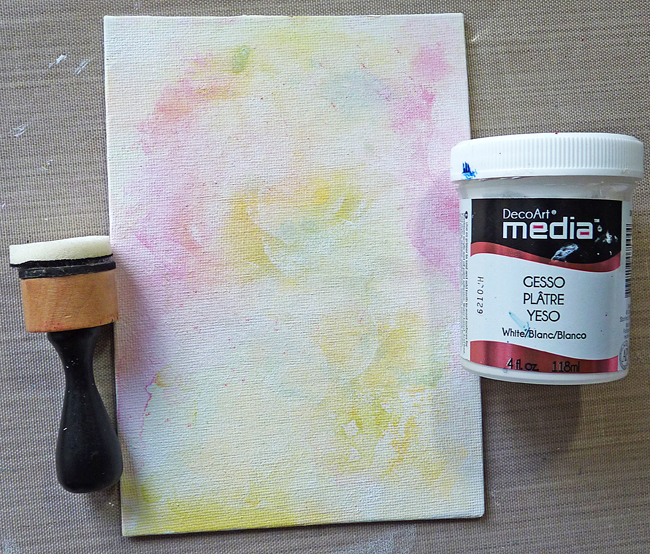 Lightly blend/daub over gesso with a distress tool and sponge. 6. 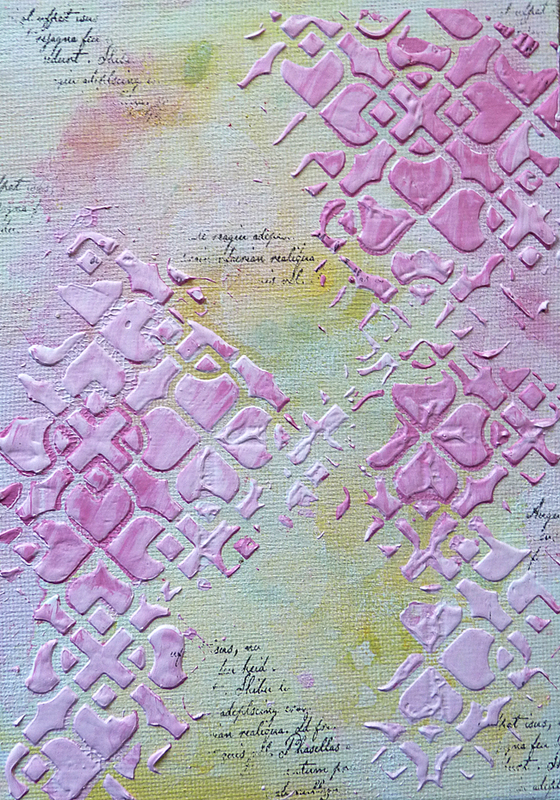 Stencil over some coloured gesso and gently heat dry. 7. Add a little stamping for interest. 8. Dry brush a little of two of the other colours (not used with the gesso for stenciling) over the raised textures (I used white and yellow). 9. Adhere a small piece of scrunched cheesecloth. 11. ........ and assemble them onto the board. 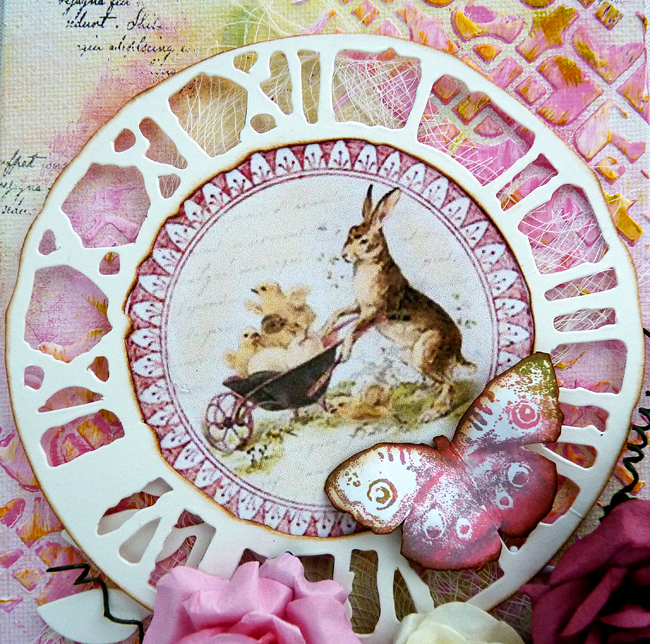 Note the vintage picture of the hare and chicks - I downloaded this from the internet as a free image and sized it to fit inside Tim's clock. And do you like the butterfly? 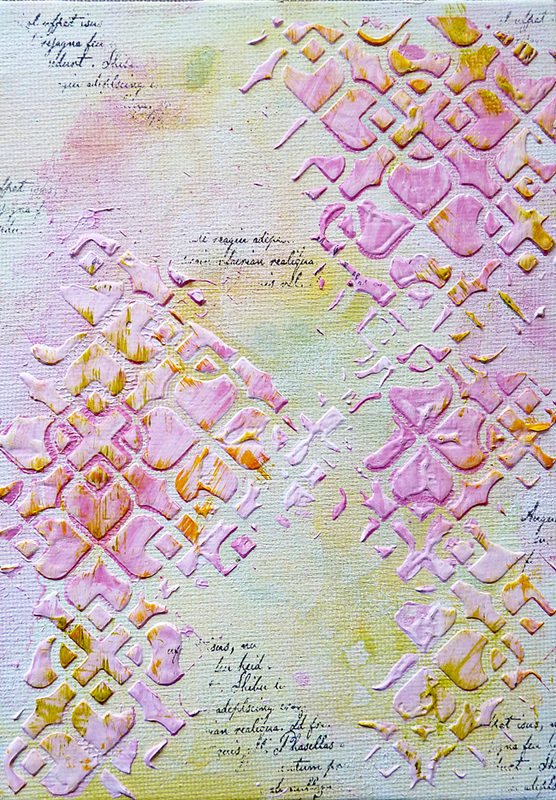 I loved stamping these, I used Tim's new Oxides - worn lipstick, peeked paint and iced spruce - and a little ordinary vintage photo distress. 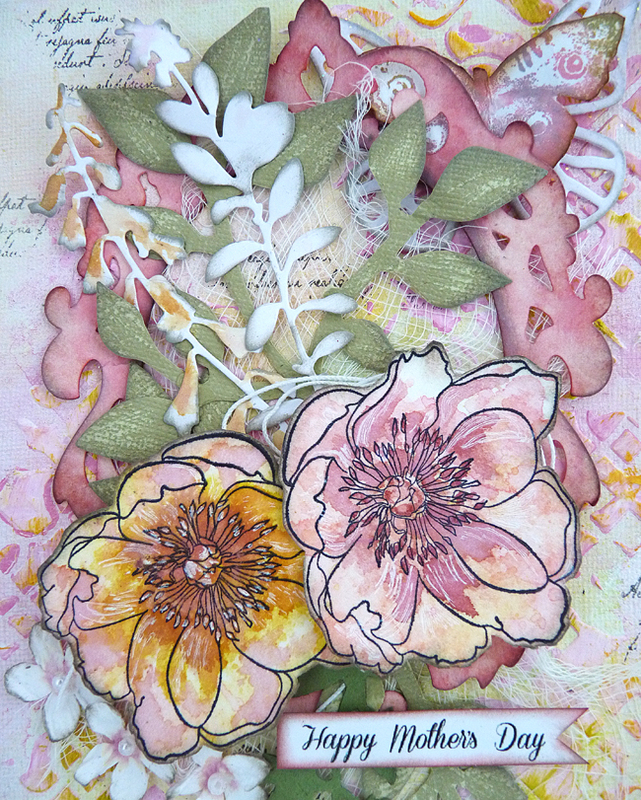 So there we have it a pretty mixed media board for Easter. 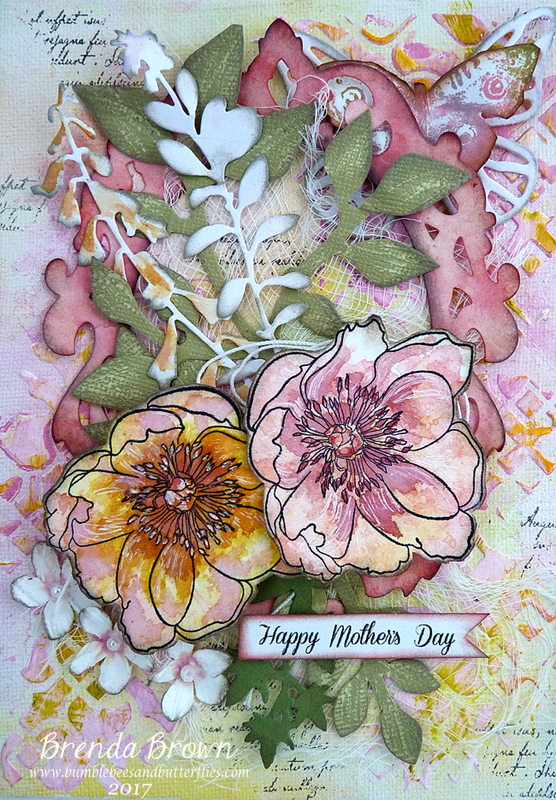 And here's the one I made for Mother's day too. For a complete change I edged everything with pumice stone rather than ground espresso or another of the brown DIs. - it's more subtle. On this photo you can see I used a white pen to highlight the flowers a little. They had been stamped and cut from card dipped in worn lipstick and spiced marmalade oxides with some fossilized amber DI added to it. 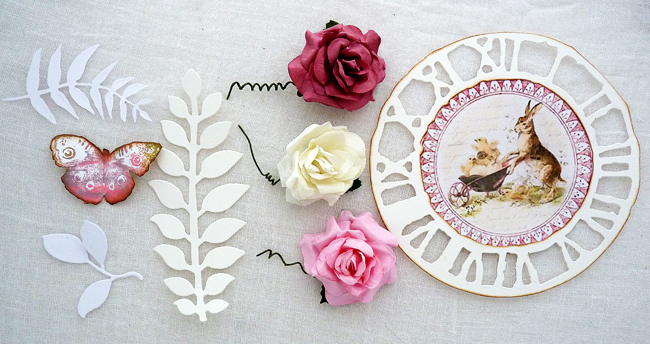 ... and added some wildflowers 2 die-cuts as well as some shop bought mini blooms. I added an easel and put it in the Packhouse. 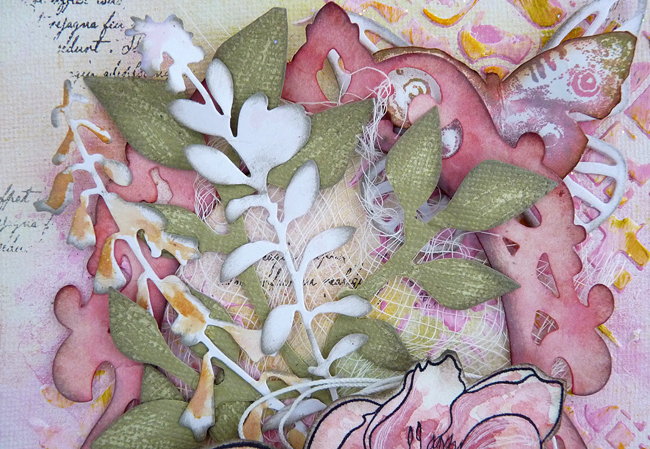 It's lovely to have you stop by, thanks so much for the interest you show in my work, I really appreciate it. 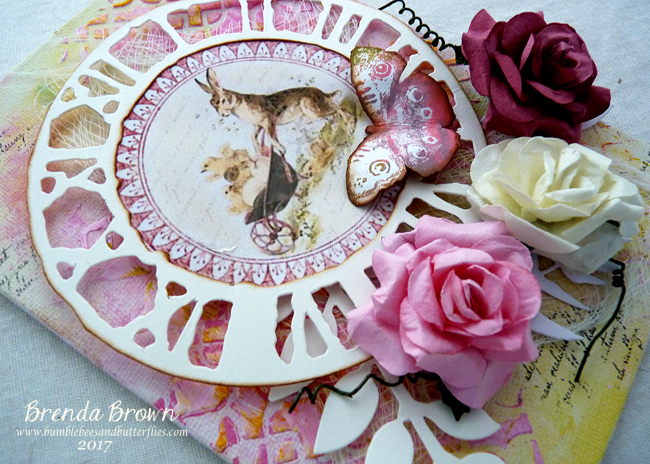 Two beautiful pieces, love the pretty colours and embellishments. 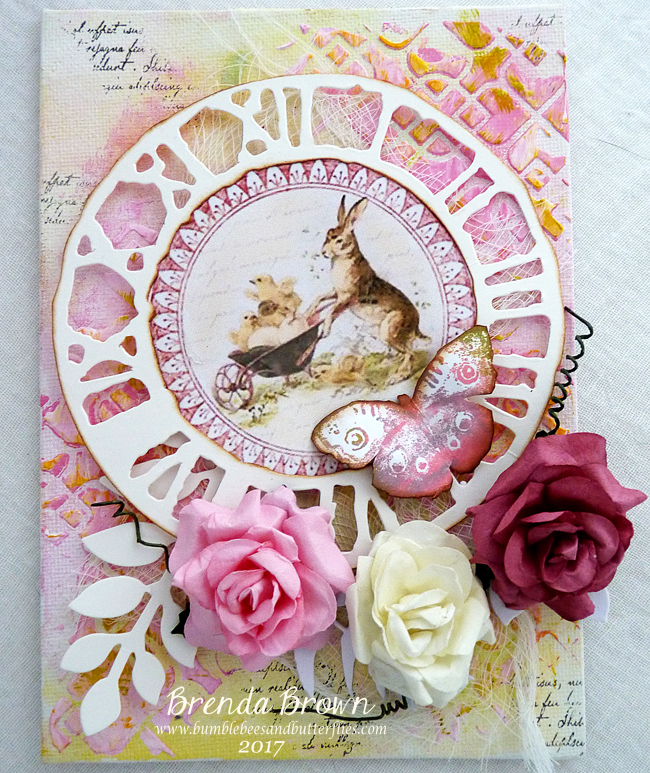 This is absolutely lovely, Brenda! The color combination is wonderful - hello spring! Great to see how you did it. Love each canvas, Brenda! Thanks for the inspiration. Happy Mother's Day! Love both these projects. 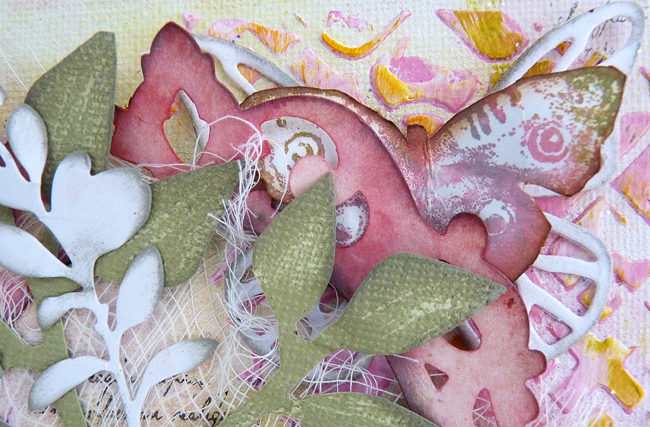 Like the colours and always love butterflies on anything. Wish the craft group I help run would want to do something like that but the lady in charge likes everything to be CAS so no point in suggesting it. Think I will have a try at it though. Thank you fir sharing this. Its a gorgeous canvas Brenda, and so it the card. Beautiful soft springtime colours. Hope you have had a Happy Mothers Day. Two complete stunners Brenda....hard to pick a favourite from them! Gorgeous! I love the happy spring colors and the flowers are so lovely! 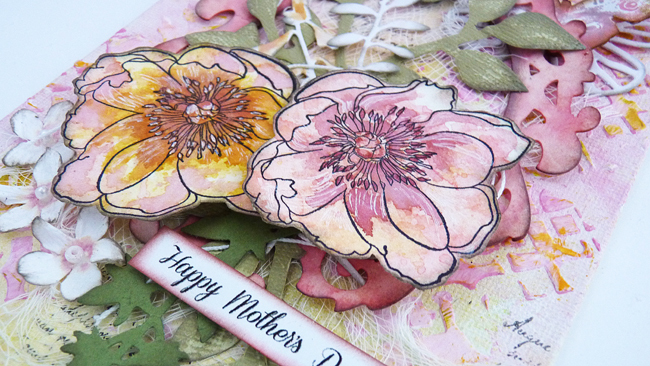 What wonderful gifts for a mother! Well, I bet that Mother's Day card flew right off the shelf! It is just beautiful! Your flowers look amazing; the colors are a lovely combination, and the overall design is fabulous! I'm sure your canvas class was a big hit! The results are GORGEOUS! After being away from my Closet for a couple of weeks, I am fully inspired by this one visit to your lovely blog! Hugs! The mix of colors on these is just LOVELY Brenda. 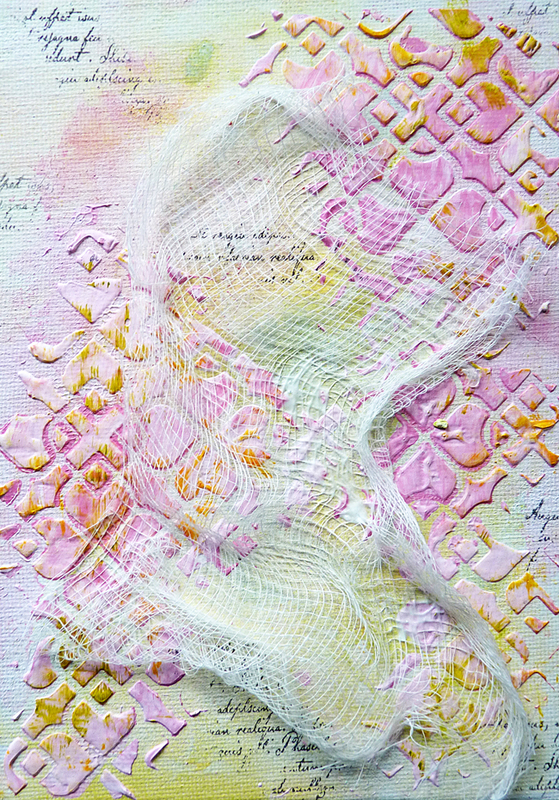 Mixed Media on Canvas is my favorite type of artwork so these just are like a breath of fresh air to me! So SPRING. So LIGHT. So AIRY and FREE. So full of LIFE. Xj. 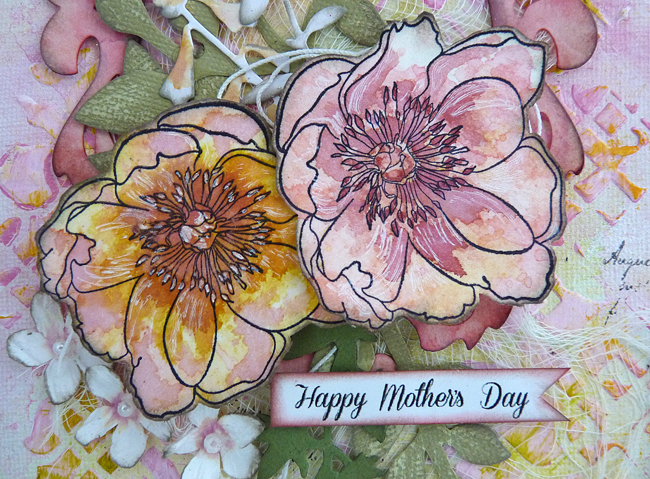 Two fantastic cards , the motherdays card really looks amazing , I love the colours and the beautiful flowers and of course the Oxide colours!! Really amazing!! Absolutely Beautiful! Both canvases!! I do love that bunny one especially!! Happy Mother's day to you as well Brenda, hope it was wonderful! Wonderful canvases! Brenda that make such lovely gifts for mothers day and Easter. Yay! I saw the butterflies and they are beauts .